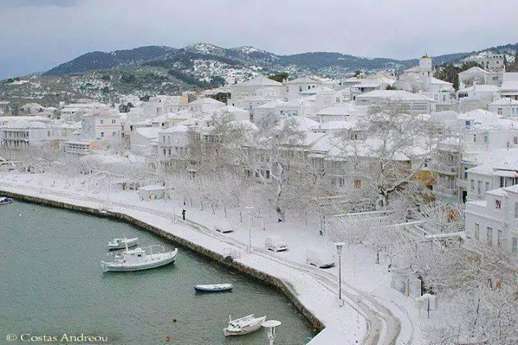 Photographer Costas Andreou captured this photo of Skopelos after a winter storm left the island covered in a blanket of white. 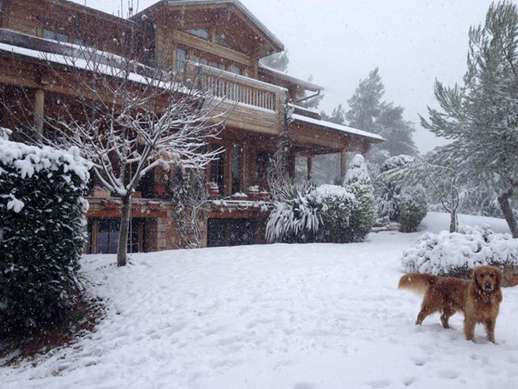 On December 30, snow fell on Skopelos and the neighbouring islands of Skiathos and Alonissos. Winter wonderlands: I was envious when a friend in Athens told me it was sunny and 17 degrees Celsius there on Christmas Day. But I didn’t feel jealous just a few days later when I logged into Facebook to find my news feed filled with reports and photos of wild winter at places all over Greece — including several islands. Beginning this past Monday (December 29), storm systems blasted many parts of Greece with a wide mix of severe weather conditions that included icy cold temperatures, gale-force winds, rain, sleet, and snow. On Tuesday (December 30), friends in Athens posted pictures of snow-dusted mountains near the city, while numerous individuals and Facebook groups like Amazing Greece/Incroyable Grèce posted links to websites and Instagram pages featuring photos of snowy scenes on the islands of Skopelos and Crete, and such mainland locations as Attiki, Kastoria, Meteora, Florina, Tripoli and Arachova. Online videos showed gale-force winds pummelling island coastlines and harbours with relentless tall waves, while photos showed pretty Christmas card scenes of snow-covered mountain villages in Crete. 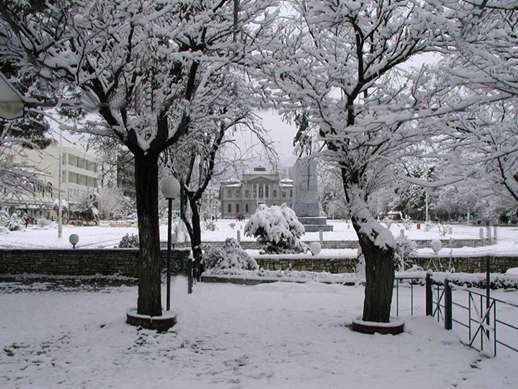 This photo shows the city of Tripoli (in the Arcadia region of the Peloponnese) following a snowfall on December 28. It was posted on the Amazing Greece/Incroyable Grèce Facebook page. A January 1 report on the Newsbomb website said fierce winds caused power outages at such diverse locations as the cities of Chania on Crete, Mytilini on the Northeast Aegean island of Lesvos, and Ioannina on the western Greece mainland. Heavy snow caused power failures and road closures at numerous spots on the mainland and in northern Greece, where temperatures plummeted to -10 Celsius and colder. 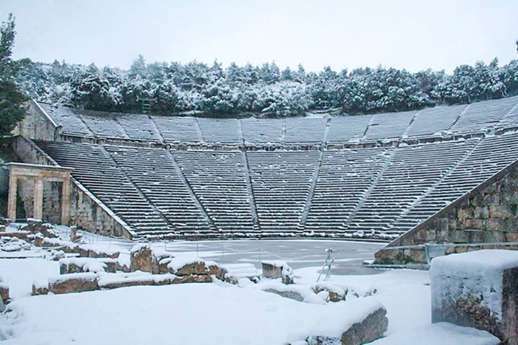 A January 1 report on Protothema News also described how the New Year got off to a frigid and snowy start in many parts of Greece. Some of the most-shared items on social media were reports and photos of snow and brutal winds at Skopelos, Skiathos and Alonissos in the Sporades island group. 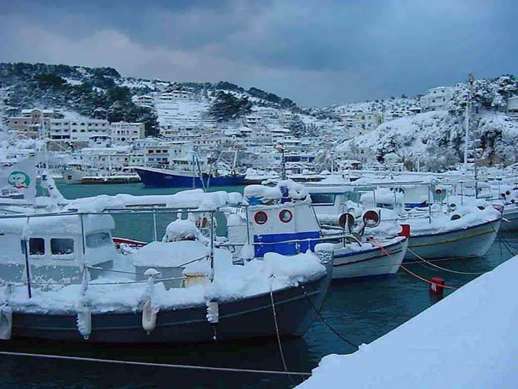 Many people seemed surprised that it snowed on Skopelos and Skiathos, which they’re familiar with from the hit movie Mamma Mia!, where many scenes were filmed. 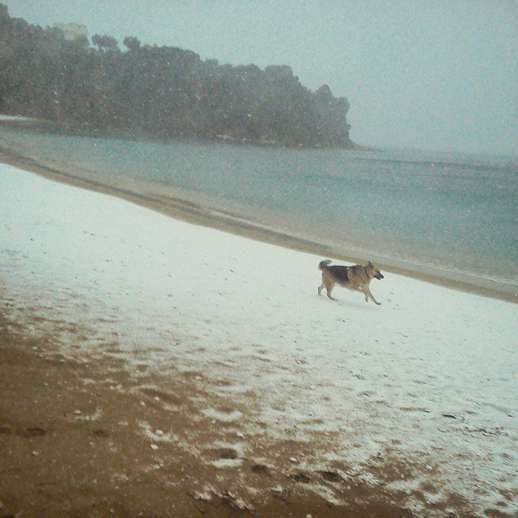 A dog plays on snow-dusted Achliades beach on Skiathos in a photo posted on the theseus.aegean Instagram feed. They aren’t alone in thinking that way — as I noted in my December 15 2013 post, Greece gets winter, too!, many friends and acquaintances of mine in North America think Greece is a balmy beach destination all year round, too. 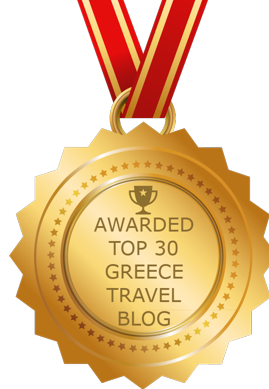 Although winter is off-season for travel to many parts of Greece, especially smaller islands, the cities of Athens and Thessaloniki are year-round tourist destinations, as are many locations on the Greece mainland. And as a December 29 2014 CNN Travel article pointed out, winter is an excellent time to visit Greece for “romantic escapes,” “city breaks,” “dramatic scenery” and more. “Falling temperatures sprinkle new magic on stone-built villages lost in deep forests and medieval castles built into that beautiful Greek coastline,” the CNN feature story says. Should you be interested in taking an off-season holiday to Greece, be sure to read the article Top 5 winter destinations on VisitGreece, the official website of the Greek National Tourism Organisation. It provides information about visiting Mount Pelion, the Zagorochoria villages, Arcadia, Arachova and Karpenissi. For information about skiing and snowboarding, the Discover Greece website offers advice on where to enjoy mountain ski holidays. If you’d rather just view winter scenes in Greece, you can see more photos of snow on Skopelos on the Potami House photo blog and on the Skopelosnews blog, as well as on the Facebook page for photographer Costas Andreou. On Instagram, check out the theseus.aegean page to see several pictures of snow falling on Achladies beach on Skiathos. There’s a few photos and a couple of video clips of storm scenes elsewhere in Greece in a December 31 post on the Protothema News website, too. And for those of you who use Facebook, don’t miss the excellent photos in the album White…snowy vineyards all over Greece!, posted by New Wines of Greece. Below is a Winter in Greece videoclip from VisitGreece. Divine wonders created by mengod on earth! 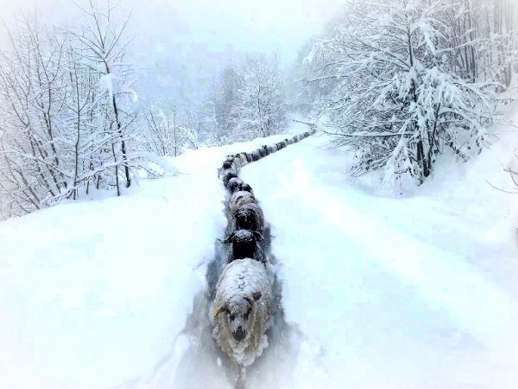 I would like to know if you have a print of the sheep walking in the deep snow. I would love to purchase one. Sorry, but I don’t — it’s not my photo and I’m afraid I don’t have contact information for the photographer.